Author Steve Coll has covered Afghanistan for almost 30 years, an odyssey that began when The Washington Post dispatched him to India in 1989 to report on South Asia. His deep regional knowledge and dazzling investigative skills were showcased in his 2005 Pulitzer Prize-winning book “Ghost Wars: The Secret History of the C.I.A., Afghanistan, and Bin Laden, from the Soviet Invasion to September 10, 2001,” a best-selling chronicle of Afghanistan’s descent into violence and terrorism, beginning with the Soviet takeover of the remote country and ending the day before 9/11. In 2011, Coll announced that he would write a sequel. That book was released this past week (Feb. 6), coincident with an ominous escalation of violence in Afghanistan. A recent BBC investigation estimates that the Taliban, the fundamentalist Islamist political group that harbored al-Qaida after the 9/11 attacks, threatens up to 70 percent of the country, and the fight has become more deadly with the entry of the Islamic State into the fray. “Directorate S: the C.I.A. and America’s Secret Wars in Afghanistan and Pakistan” (Penguin Press, $35), is named for a wing of the Pakistani secret service that aids and supports the Taliban and other terrorist groups. It takes up the story after the U.S. victory over the Taliban in 2001, a moment of hope and optimism that descended into confusion and conflict as the U.S. became distracted from its Afghanistan mission by the war in Iraq, and as a corrosive mistrust developed between the Afghan government and the U.S. 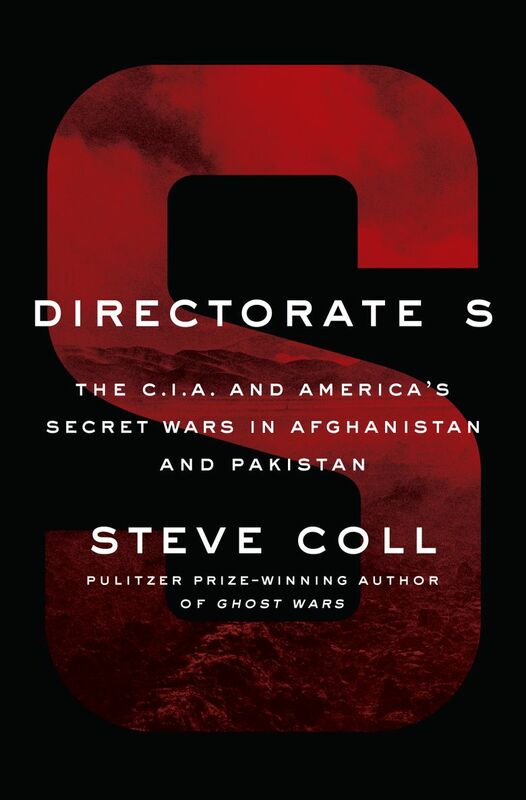 The author will discuss “Directorate S” at 7:30 p.m. Thursday, Feb. 15, at Pigott Auditorium at Seattle University. He’s the second presentation on a “political doubleheader” after Jeremi Suri and Rajiv Chandrasekaran at 6 p.m. Tickets are $5 (townhallseattle.org). It’s deeply sourced — Coll, a New Yorker writer and dean of Columbia University’s graduate school of journalism, conducted more than 550 interviews. It’s sad, frightening and moving in its depiction of the human toll of the conflict. Coll, who appears in Seattle on Feb. 15, answered questions about the book on the telephone: This is an edited version of the conversation. Q: Reading your book helped me appreciate the U.S. government employees, many in the CIA, who have sustained their commitment to solving the Afghanistan/Pakistan riddle, despite the horrors of the conflict and bureaucratic warfare between U.S. spies, the military and other officials. I imagine the rate of burnout must be tremendous. Why do they stick with it? A: I think it’s out of affection for the country. It’s a special place. It has suffered so much, and it’s suffered at the hand of outsiders. There’s a generation (of Americans) that went on the hippie trails in the VW buses when Afghanistan was a peaceful, magical place. It was a country that didn’t invade anyone and didn’t have a lot of internal violence from 1910 to 1979. One of the binding forces of the national culture was poetry read on the radio. It had a jaw-dropping landscape and deep hospitality. And then this nightmare of the Soviet Union’s making began; it’s been going on ever since. I think every American who went over there was moved by the truth of the Afghan people who poured home after we defeated the Taliban (in 2001) … They thought wow. We’re going to get our country back. A number of Americans were very sympathetic to that. Q: How did you get people on all sides of the conflict to talk to you? Why did officials in Pakistan’s secret service, the Inter-Service Intelligence agency (ISI), cooperate? What is their interest in seeing a comprehensive book like this published? A: In “Ghost Wars” and in this volume, I have had an ambition to write with equal empathy across borders. I have such a long history, from the original accident of assignment (to South Asia), that … I can work with people. People know who I am, they have read my stuff. I desperately want to get this as right as I can, since a lot of this information will remain classified (in the U.S.), and in Pakistan and Afghanistan there won’t ever be any records. It will be as accessible and thorough a history as there will be for a while. Q: Your book shows how officers within the ISI have continued to support the Taliban in Afghanistan, despite numerous deadly attacks within Pakistan and on Pakistanis by branches of the Taliban operating there. What is the motivation? A: The Pakistani officer class — and they are ultimately the directors of the spy service as well — have a proud nationalistic tradition. There’s a conviction that India is under every pillow, that it’s out to destroy Pakistan. Over the years that (belief) has become a rationale for army influence in Pakistani politics … the whole country has moved to the right as the years have gone by. The practical reason is that Pakistan feels vulnerable to Afghanistan. They share a long and open border, and the people along the border don’t even recognize its legitimacy. The fear is that without a buffer strategy of political influence, that India will use Afghanistan to destabilize Pakistan. Q: What is India’s role in Afghanistan? A: It’s nowhere near as significant as Pakistan thinks it is. It has had a long relationship with the Afghan government, and supported Afghanistan when the government was reconstituted in 2001. It’s soft power — roads, hospitals, some military training. They don’t want to … further provoke the paranoia of ISI. As long as we (the United States) are in there fighting the terrorists, they can free-ride on our military commitment. Q: Islam is the state religion of Pakistan — how does religious faith affect the motives of the ISI? A: It’s a very diverse officer corps. The junior officers are more pious; the senior officers are ardently nationalist, more nationalist than even 20 years ago, given the violence and pressure they have come under. When you talk nationalism you’re talking about a country that was founded on the basis of Islam. I think Americans have always struggled to figure out how personal faith among Pakistani officers may affect their political judgment. The lazy way is to take them out for a drink. That doesn’t work with these guys. Q: How do you see Afghanistan’s future unfolding? A: I’m not a great forecaster, but I don’t think anything is likely to change. The presence of the U.S. military makes it very difficult for the Taliban to win. They don’t have an air force, they don’t have anti-aircraft weapons. They don’t have the amazing technology of the opposition. The Afghan government is stuck. In 40 percent or more of the country’s rural districts, the Taliban are embedded. They are present in other parts of the country where they don’t have ethnic or religious roots … It’s even more complicated, because now all this violence has created an ethnic polarization in the rest of the country, and there’s a constitutional crisis in Kabul that’s been going on for three-and-a-half years. Mary Ann Gwinn writes about books and authors for The Seattle Times and other publications. mgwinn@seattletimes.com.